It's the end of the year again. Why not celebrate another great year in Neopia with a look back at some of the biggest events of the year! Hello, and welcome to This Year in Neopia. This page was inspired 100% by me, xemoangel92x. On December 17, 2009, I came across a board in which someone who was away from their account for a year wanted to know what they had missed. Then, I had a great idea. Why not compile the biggest news happenings of the year in Neopia into one petpage? And ta-da! This Year in Neopia was born! This year in Neopia marked the 10 year anniversary of the launch of Neopets with the official birthday being on November 15th. The few veteran users who have been here since the launch in 1999 recieved new, shiny shields on their userlookups to commemorate their 10 years as a veteran Neopian. The ten year celebration sparked widespread festivities throughout Neopia, leading to many other first-times, limited-times, and other fantastic events! The festivities were honored by allowing everyone to send game scores not three times, but ten times from November 15 until the end of the year! Along with the usual Happy Birthday avatar released every year on November 15th, the 10th birthday also showed the release of a special avatar to commemorate the special date, which was released with the "Celebrating Neopets 10th Birthday Background" item. Obtained by viewing the 10th Birthday Celebration page on November 15, 2009. In celebration of Neopets' 10th birthday, the Games Master Challenge this year released a special list of challenges to commemorate the ten years of Neopets' existence. Not only did players get the chance to tackle new, exciting, and difficult challenges to earn top prizes and shiny userlookup trophies, but they also got a small lesson on Neopian history. This was the second year that the Games Master Challenge released NC Mall challenge tickets. The dominating plot of Y11 was the Atlas of the Ancients plot, which began on October 14th and ended on December 16th. The plot came after speculation about a possible Lutari Island plot. The main character, Roxton Colchester III, was from the Tale of Woe plot. He was joined by his sidekick, Clara Chatham. Surprisingly, the Wise Old Gnorbu from the Shenkuu Lunar Temple was also featured in the plot. The plot revolved around the crew of the flying ship, the SS Primella, on their journey around Neopia. This plot differed from past Neopian plots in many ways. These differences either caused praise or scorn around the Atlas of the Ancients board on the NeoBoards. The plot involved several trips back to the comic strip, which made a slower completion to users with slow internet connections. Each step completed was rewarded with its own special prize, which was in turn added to your quest log. The number of items in your quest log denounced your completion of the plot when it was time for final prizes and trophies to be awarded. The plot prizes also included an avatar and a site theme. Awarded as a prize for participating in the 'Atlas of the Ancients' plot. After a discovery of this new world by the Atlas of the Ancients crew, Moltara City officially opened on November 12th as a part of step 6 of the plot. This new world was full of new opportunities and new mysteries just waiting to be discovered. The main use of Moltara at the time was for making Moltara Petpets. These critters are made by visiting Tangor's Workshop with pieces and parts for him to put together to make a new and loving petpet for your Neopet! But wait, you must collect these parts yourself by visiting areas around Moltara City. By visiting the Obsidian Quarry at the bottom-left corner of the Moltara City map, you can collect pieces of Obsidian. Miscellaneous Gears are located randomly around Moltara City. While looking at the map, you simply have to look for a random pile of gears and click on them (you may need to refresh). You also need Scrap Metal and Stone to create a petpet. These can be obtained by random event while refreshing on the Moltara City map. Take these items back to Tangor and you might just go home with a brand new petpet to surprise your Neopet with! Some of the following petpets can even be combined to make new ones. On December 14, a new worm hunting activity became available in Moltara City. Simply by visiting Lampwick's, you can receive your Empty Lantern to begin collecting any of the ten worm colors around Moltara. After collecting a worm of each color (red, orange, yellow, green, blue, purple, white, black (shadow), rainbow, and pink), you can go to the Dark Cave to look for some Red Moltite to take to Tangor along with other items around Moltara to create even more petpets! As if the discovery of a new world wasn't exciting enough in itself, how about a new pet color? 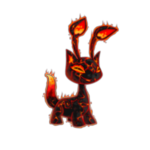 Magma pets were first rumored by early evidence of cave paintings discovered by Roxton and Clara that showed fire painted pets. Finally released on December 14th, sitting in Moltara City is the Magma Pool. If you're lucky enough to make a visit to this molten pool of magma while its guards are asleep, you may be the owner of a new, fiery Neopet! Wouldn't it be cool to be an owner of one of these pets? Krawk Island Wins the Altador Cup! The summer of Y11 held host to the fourth annual Altador Cup. Many Neopians signed up for their favorite teams and took part in sending their scores for Yooyuball, Slushie Slinger, and Make Some Noise. It was a fierce battle between the twelve Altador Cup teams, but Krawk Island was victorious. Krawk Island fans all over Neopia rejoiced as the cup results were announced. In case you were wondering, Shenkuu took 2nd place and Lost Desert took 3rd. Released on August 8, 2006 shortly after the Tale of Woe plot, this avatar featuring the infamous orange Blumaroo chef from the plot's ship became the most frustrating avatar in Neopian history. Several theories were made, tested, and failed as to the solution of this tricky avatar. For three years, the avatar's solution was entirely unknown until August of this year when an anonymous user sent an e-mail containing the solution to AvatarLog, an off-Neo site for secret avatar collectors. Finally, after three years, the mystery of the Chef Bonju avatar was solved! The avatar is only available during the month of August, however verification is needed in August Y12. In the Mystery Island Cooking Pot, mix the items Orange Juice, Gourmet Cooking For Your Pet, and Blumaroo Steak while having "Mad About Orange" as your active avatar. Only available in month of August. The Discarded Magical Blue Grundo Plushie of Prosperity has been a speck on the Faerieland map for possibly as long as Faerieland has existed. For many years, the plushie appeared literally as a blue speck on one of the clouds on the main Faerieland map. Upon clicking this speck, you were taken to a very sad looking Blue Grundo Plushie that seemed to be of no use whatsoever to Neopia. No wonder the poor plushie was so sad! Finally, as a result of the new Faerieland makeover, the plushie became a new Daily for you to visit! Visit the plushie every day and you may be rewarded with a plushie, a toy, some Neopoints, or your active pet may be so excited to see the little plushie that it forgets it is hungry! That's not all! You could even receive an avatar from the plushie, if you are lucky. Randomly awarded when interacting with the Discarded Magical Blue Grundo Plushie of Prosperity in Faerieland. There are many Limited Edition pets in Neopia that can only be obtained on their very own day during the year. Even then, only a certain number are released at a time, and then they're gone. That's why they're Limited Edition. However, there are two pets in Neopia that must be obtained from expensive items. One of these pets is the Draik. Normally, you must hatch a Draik from a Draik Egg, which can be obtained from the Meridell Food Shop ranging in rarity from 95 to 99. You can also obtain one from morphing potions or a transmogrification poition. However, this year, TNT accidentally released Draiks on Draik Day as they do other LE pets, such as the Cybunny. People all over Neopia were hurrying to create a new Draik while they could for free. New games released this year had a new purpose in Neopia, thanks to the notorious gamer AAA and his sister Abigail. The idea for the new game challenges is the same as the idea for the Daily Dare, which is held in March. AAA and Abigail both achieve a score in the new game, however Abigail's is always lower. Unlike the Daily Dare, you can receive prizes from both AAA and Abigail upon beating their score. Each new game challenge remains open until the next game is released. Only TNT knows when that will be! You can also purchase NC tickets from the NC Mall to participate in the NC Challenge. We Neopians have had a bit of trouble in the past figuring out what to do with our shops, petpages, userlookups, and guilds when TNT decides to change their coding filters. This year's coding filters involved the "position" CSS tag as well as HTML links in shops. For a few days, no one could edit any of their coding as the message about the "deranged code Mynci" came up when anyone tried to save their changes. As always, some clever user has thought of a solution and decided to share it with the rest of Neopia so that everyone can get all their coding to comply with the new filters. Still having trouble? Check out this petpage. Also, I would like to add some screenies to my page, if at all possible. Since I did not take any screenies, I am asking anyone who may have any of the following things in screenie-form that they would like to donate to my page. Full credit will be given. If you think you may have something I could use, Neomail Me. Also Neomail me if you need anymore detail as to what I am specifically looking for. The first Bonju avatar owners posting on the Neoboards. Boards about the Faerieland makeover. Problems with the coding filters (Y11). Bullets & Counter Base from Amber's Pixels. Link Button Base from Pinkstar (now closed). Avatar solutions found at AvatarLog.